Where to Buy Nuvan Prostrips, Nuvan Prostrips 12 x 16 Grams Packs With 12 Cages - $40.00 for Sale with Fast Free Shipping! Nuvan Prostrips 12 x 16 Grams Packs With 12 Cages provide unique vapor action protects areas continuously for just pennies a day with no odor or mess. Cirkil CX Concentrate Insecticide Ovicide -.. Include cages features a convenient plastic cage that may be selectively placed or hung, protecting enclosed areas for up to four(4) months with a single application. Get continuous, long-lasting protection from pests in difficult-to-reach areas such as attics, basements, crawl spaces, closets, pantries, sheds, garages and RVs. Nuvan Prostrips are effective against tougher, more common pests, such as ants, bedbugs, cockroaches, bees/wasps, pantry pests, flies and mosquitoes. DDVP--18.6% is the active ingredient in Nuvan Prostrips. DDVP is 2,2-Dichlorovinyl dimethyl phosphate. such as stored grains and foodstuffs. Pest strips containing DDVP have remained on the market since first introduced in the 1960s. 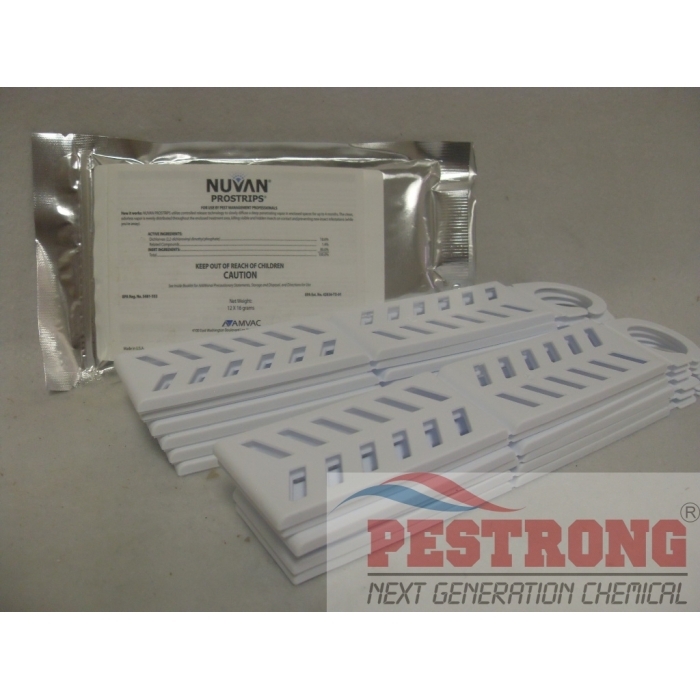 However, pest strips have never been labeled for professional use before the introduction of Nuvan Prostrips. How long do Nuvan Prostrips last? When used in accordance with label directions, Nuvan Prostrips provide protection from pests for up to four months. What is the mode of action of Nuvan Prostrips? The active ingredient in Nuvan Prostrips is DDVP which is a cholinesterase inhibitor that acts on the pest’s nervous system. Pests that are exposed to vapors from Nuvan Prostrips are destroyed. When used in accordance with label directions, Nuvan Prostrips do not pose a risk to humans and other mammals due to the extremely low dosage of DDVP present. Nuvan Prostrips may be placed in many areas where pests are a concern. Each strip is designed to protect up to a specified volume of area for up to four months against labeled pests. Nuvan Prostrips may be placed within the cage provided and hung or placed within the area being treated. Always read and follow label directions. Where would I use Nuvan Prostrips? Nuvan Prostrips may be placed in many areas including; attics, cabinets, closets, basements, storage sheds, crawl spaces, pantries, pump houses, utility boxes, garbage dumpster areas, trash cans, compactor rooms, vacation homes, hunting cabins, recreational vehicles, boats, motor homes and other areas. Always read and follow label directions. What is the novel application method? Nuvan Prostrips are applied by simply placing the strips in the area intended to be treated. The strip then controls pests in the treated area for up to four months. Are Nuvan Prostrips effective immediately? Depending upon various climatic conditions (i.e. temperature, barometric pressure, etc.) Nuvan Prostrips effectively treat the intended area when the effective concentration of DDVP vapors emerge from the strip. It can take up to several hours for the effective DDVP concentration to be reached in a treated area. Is there an odor from the vapor action? No, Nuvan Prostrips’ vapors are virtually undetectable by humans and pests. How long does DDVP last? DDVP or Dichlorovos is a non-residual product. Once exposed by application DDVP acts quickly on labeled pests however, after application DDVP residues are quickly degraded which is why it is not a residual product. The impregnated resin strip slowly releases DDVP for up to four months which serves to make Nuvan Prostrips act as a residual application type product. What pests are Nuvan Prostrips effective against? Nuvan Prostrips are effective against all labeled pests including ants, bees, centipedes, cockroaches, fleas, flies, crickets, earwigs, sow bugs, scorpions, spiders, ticks, wasps and other pests. Is DDVP effective against flies and other pests? The DDVP contained in Nuvan Prostrips is highly effective against many flying pests including flies. Efficacy tests of DDVP against other pests are being conducted and pests will be added to the Nuvan Prostrips’ label as effectiveness is proven and EPA registration is received..
Is DDVP effective against bed bugs? Recent laboratory testing indicates that DDVP is highly effective against all bed bugs strains, even non-susceptible strains. Registration of Nuvan Prostrips for control of bed bugs is currently being pursued. How are Nuvan Prostrips packaged? Nuvan Prostrips are 16 gram strips designed for application in areas up to 200 cubic feet. Nuvan Prostrips are sealed in foil packets and convenient plastic cages are provided for application use. What do I do with the strips I don’t need to use after I’ve already opened a foil pack? To optimize the effectiveness of Nuvan Prostrips, it’s best to use the strips once the foil packet has been opened. The foil packet may be re-sealed to prolong the useful life of unused Nuvan Prostrips. Once applied Nuvan Prostrips will remain effective for up to four months however, if not thoroughly sealed, the useful life of the Nuvan Prostrips may be diminished. What causes the useful life of the strips to decrease even if was left in an opened foil packet? DDVP is not a residual pesticide. Once the foil packet is opened, the DDVP present in the resin plastic strip may begin to interact with moisture present within the air. Moisture causes DDVP to degrade quickly over time. The unused Nuvan Prostrips must be carefully sealed within the foil pouch to assure that little or no air or moisture is present within the foil packet. How do I properly re-seal the packet to protect the unused Nuvan Prostrips? To properly protect their useful life, Nuvan Prostrips are sealed in foil packets during manufacturing. If all of the Nuvan Prostrips contained in the foil packet aren’t used, contain the remaining unused strips in the foil packet. Squeeze out as much air as possible from the foil packet, fold over the opened end at least twice and seal with tape to sufficiently protect your unused Nuvan Prostrips. The shelf life of Nuvan Prostrips may be diminished by as much as a month or more if left unused. We do not recommend storing Nuvan Prostrips in zip lock plastic bags. The efficacy of Nuvan Prostrips is better protected in a foil-lined packet. How do I dispose of used Nuvan Prostrips? Used Nuvan Prostrips with no remaining useful life may be disposed of by wrapping in paper, plastic or other suitable material and placed in the trash or offer for recycling. Nuvan Prostrips less than four months old should not be placed in the trash. This company always have a good deal. Fast shipping. Great product, great customer service, and fast shipping. Don't need spray, just hang it. I love this product.